Merit's Megatouch Aurora marks a revolutionary advance for touchscreen entertainment. The elegant, rounded design invites players with a dynamic multi-color light show that extends the game beyond the screen. The Aurora's dazzling halo is part of the game experience, responding to the players' progress, rewarding high-scores, and drawing onlookers from all angles into the action. 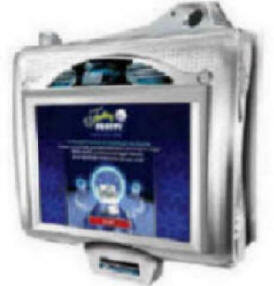 New 19 inch Widescreen Display. Thousands of New Trivia Questions and Photo Hunt images. The LED halo produces an exciting light show each time a new high score is achieved. Arcade Game Style Joystick and Buttons to enhance play on some games. A built in Wi-Fi & Ethernet connection allows AMI customer service to connect directly to a consumer's unit to diagnose and fix problems. Merit’s Megatouch Aurora WS delivers an expanded widescreen experience to players, plus a new media side-bar for advertising and promotions. Integrated credit card support offers a convenient means to purchase more credits and will also serve as an instant player login, driving repeat play. Improved internals, more memory, a cooler, quieter system, and widescreen play – the Aurora WS. More to touch, more to love. The Megatouch Rx is the cure for the common countertop game. More than just a pretty face – its low profile, weather resistant* design opens up an array of new placement options, while a clean internal layout makes serviceability a snap. The e.V.o. Ion is a self-contained unit that includes over 150 games, flatscreen touchscreen and a joystick and one button for four new games on the system. The e.V.o. 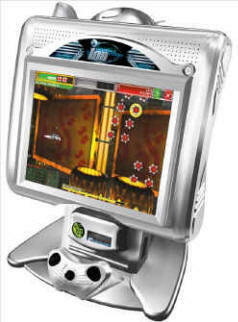 Ion comes with a huge library of games (165 games in all), including games from previously released MegaTouch ® versions. Available in 15" or 17" monitors. Full motion video brings exciting games such as Trivia Whiz & Penthouse Video Boxxi to life, The Megatouch Nation – Welcome to the exciting world of Megatouch Nation where players with a PLAYER KEY are entitled to a host of exciting Merit offerings, Wireless Antenna – Megatouch Ion features wireless communication, The Joystick Touchscreen Advantage – Experience the joystick touchscreen advantage with these exciting 3-D games! Your customers will enjoy the performance power of joystick precision with touchscreen control – it's very addicting! Music and games* together in one wall unit. Merit’s Megatouch Entertainer is the ultimate entertainment option for both diner booths and vending machine areas, allowing patrons to play cool games or hot new music from the AMI music network. This all-in-one unit enables operators to maximize profit from their existing locations, as well as target other single-room settings, such as lobbies, office break rooms, laundromats, and school cafeterias. 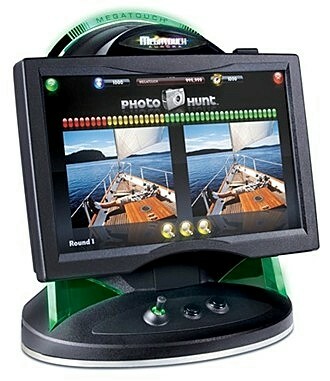 Merit's newest Megatouch ®, the Megatouch ® Fusion Ion is the upright version from the touchscreen game leader. The Fusion Ion features over 150 games, flatscreen touchscreen and a joystick and one button for four new games on the system. 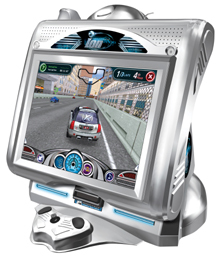 The Fusion Ion comes with a huge library of games (165 games), including games from previously released MegaTouch ® versions.